The book is available to borrow in standard print, large print, ebook, and audio formats from the library. Email morton@hudsonarealibrary.org for more information or to register. The Hudson Area Library Nonfiction Book Group reads nonfiction books with a focus on history, social and political life in the Western Hemisphere. 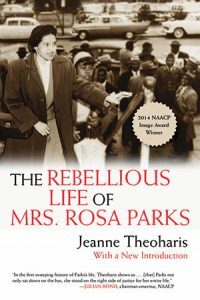 This entry was posted in Adults, News, Programs and tagged Non-fiction book group, reading and discussion, Rosa Parks by smcintosh. Bookmark the permalink.